The peninsula of Kamchatka lying near a zone of a convergence of huge earth’s plates and being one of links of the Pacific volcanic ring, represents a huge natural museum of the volcanology which “exhibits” are operating and extinct volcanoes, and also any accompanying educations – geysers, fumarols (steam-gas streams), hot springs, mud coppers etc. In 1996. The Kamchatka peninsula was included in the list of the World heritage. Six separate sites which settle down in the east, in the center and in the south of the peninsula, the total area about 3,8 million hectares enter into object of heritage. Taken together, they reflect practically all main vulkanogenny landscapes of Kamchatka, but thus each of them possesses also bright identity. On only six sites about 30 operating and 300 extinct volcanoes, and also more than 150 thermal and mineral sources settle down. From the South to the north peninsulas were stretched two volcanic ridges — Average and East. In the Central Range (extent of 900 km), more ancient, about 120 volcanoes and more than 1000 slag cones, but operating are only volcanoes Ichinsky and Hangar. The height of the Ichinsky volcano of 3621 m, is the highest volcano of the Central Range. In the sizes, an unusual form, beauty and exits of blue obsidian it always drew to itself(himself) attention, but routes to its top have high category of complexity and are available to only skilled climbers. East ridge (extent of 850 km) — a belt of a modern young volcanism. 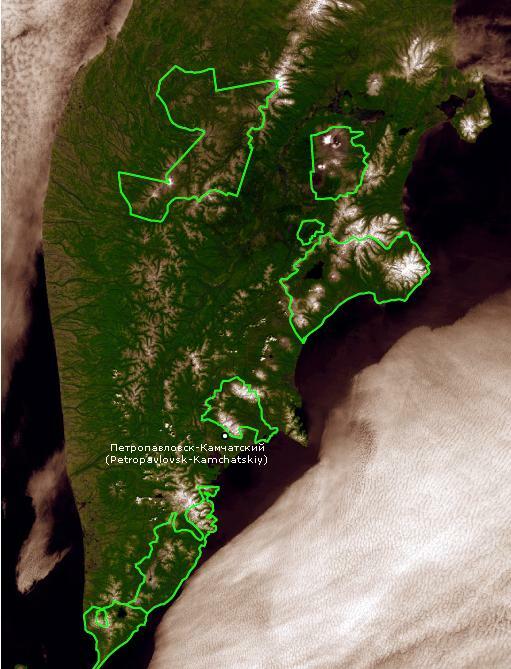 It is presented by about 100 powerful volcanoes, 30 of which operating, and 6 among them the most active (Mutnovsky, Avachinsky, Karymsky, Klyuchevsky, Anonymous, Shiveluch). The highest volcano of Eurasia — Klyuchevskaya Sopka (4750 m), is a volcano of surprisingly correct classical form. Klyuchevskaya Sopka collected round itself group of 12 volcanoes, the area of Klyuchevsky group of volcanoes has the status of natural park. Volcanoes are born and today. 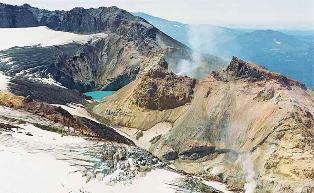 Kamchatka — the unique natural laboratory, allowing to observe it. In 1975-1976 the whole world watched eruption performance when from the crack formed on a plateau the lava rose and cones of New Tolbachinsky volcanoes grew. Near Petropavlovsk the group «House volcanoes» (Koryak — 3456 m, Avachinsky — 2751 m, Kozelsk — 2190 m) settled down. Operating are Avachinsky and Koryak. Авача it is constant in work, the last eruption was in 1991. An ascension on the Avachinsky volcano very popularly among tourists, under the direction of the skilled instructor it is possible to rise by top in 6-8 hours. The last eruption of moderate force at the Koryak volcano took place in 1956-1957. Here it is located well-known and it is inexhaustible rich with mushrooms, berries and Bombardment cones — the hilly plain with disseminated here and there volcanic bombs. Snow on slopes of volcanoes doesn’t descend to the middle of July therefore mountain skiers and snowboarders have a fine possibility to train in the summer on slopes of Avachinsky and Kozelsk volcanoes. 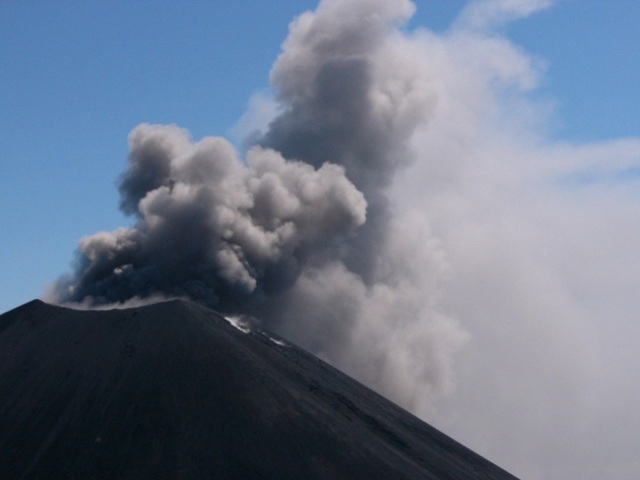 The attention involves also Mutnovsko-Gorelaya group of volcanoes which is in 80 km to the south of Petropavlovsk on the opposite coast of the Avachinsky bay. Fumarolnye of a field of a volcano Mutnovsky (2323 m), according to scientists, are by the most extensive in the world, are one of the most active volcanoes of Kamchatka, at its bottom the Mutnovsky geothermal power plant is constructed. Near to Mutnovsky there is a volcano Burnt (1829 m). Very interesting volcano, on the structure reminds volcanoes of the Hawaiian type, has 10 craters some of them are filled with volcanic lakes. The ascension on a volcano not difficult, but a lunar landscape of top really impresses the traveler. The last volcanic eruption was in 1986. Volcanoes Karymsky, Bezimanniy and Shiveluch are extremely interesting to volcanists as their activity, the birth of new volcanic forms and geological educations, occurs literally in the face of. Vulcan Karymsky (1486 m) — one of the most active volcanoes of Kamchatka. Has the correct cone with two doubled craters at top in the sizes about 250 m. Activity of a volcano proceeds since 1996. Vulcan Bezymyanniy (2882 m). In the crater which has arisen at a catastrophic volcanic eruption in 1956, continues raise a lava dome. Since the end of the 70th of last century strong volcanic eruptions occur regularly — one or two times a year. The last volcanic eruption was observed on June 19, 2004. Vulcan Shiveluch (3823 m). In 1980 in a crater of the beginnings raise a lava dome, its growth proceeds and now, being accompanied by separate peplovy emissions and strong eruptions. The last eruption occurred on May 10, 2004. The Kamchatka volcanoes – one of wonders of the world and one of the main natural sights of our country. The type of majestic cones of fire-spitting mountains, lakes in the huge round hollows calderas formed by volcanic explosions, lunar landscapes of stone deserts at feet of volcanoes, a cosiness of hot springs – natural baths and many, many other phenomena connected with volcanoes, create shape of volcanic areas of the world – fine, terrible and attractive.